A post Brexit oil price surge gave shares of BP Prudhoe Bay Royalty Trust a welcome boost last month. 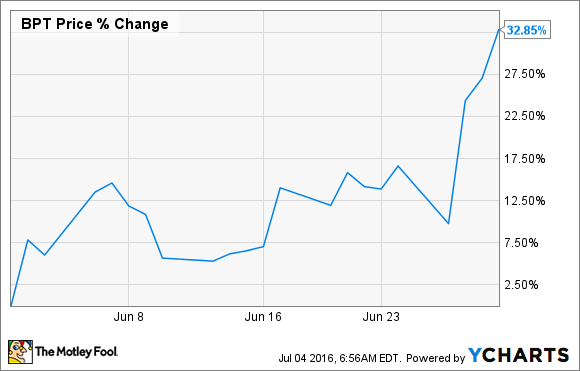 What: Shares of BP Prudhoe Bay Royalty Trust (NYSE:BPT) jumped 32% in June. Much of that large jump came as the stock market shook off fears of the Brexit referendum and Brent crude oil prices jumped over $50 a barrel. So what: The thing that investors need to know first and foremost is that investing in the BP Prudhoe Bay Royalty Trust is one of the most direct investments in oil prices. It's simply a partial ownership stake in BP's Prudhoe Bay oil field. This makes its payouts to shareholders, and its stock price, very much a proxy for oil prices. After such a large oil price gain following the UK referendum result, it would be a bigger surprise if the trust's shares didn't react the same way. Now what: To get your money's worth out of investing in this trust. You have to assume that there is enough oil left for a sufficient amount of royalty payments, and that oil prices will be on the incline enough to make up for any decline in production. With shares trading at a dividend yield of 15.6% and chances that those payouts will rise with higher prices mean that it now may be one of the more opportune times to look at picking up shares of this royalty trust.